This broad, elegant, tree-lined walkway would extend from downtown Bellevue's existing pedestrian corridor (which runs from Bellevue Square to the Transit Center) eastward, past City Hall on the south and The Bravern and Meydenbauer Convention Center on the north, across a graceful new bridge over the I-405 freeway,3 past a signature commuter rail station to 120th Ave., and perhaps eventually all the way up the low rise to the east. 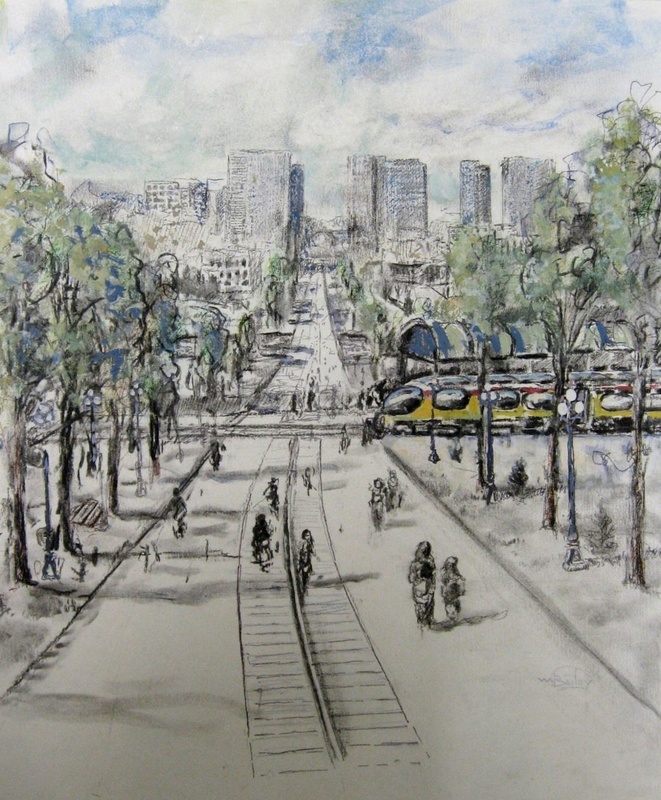 Downtown Bellevue's Grand Esplanade can simultaneously solve several major problems, while creating new opportunities. It would provide users of a commuter service on the railroad with a safe, pleasant and relatively short walk5 to points throughout the downtown. It would tie together the existing downtown with its inevitable expansion to the east of I-4056 (and at the same time, facilitate, and even hasten, this expansion). It would help transform Bellevue into a truly pedestrian-friendly city.7 And it could facilitate the development of a unique, visually attractive entrance to the city worthy of a European capital. Thanks to William Bailey for the drawing. 1These challenges include far higher fuel prices, accelerating climate change, greater awareness of the severe health effects from toxic emissions from automotive traffic, increasing recognition of the major health benefits from walking, and accommodating a much larger population. 2Another example is the proposed extension of the railroad to the combined UW Bothell and Cascadia Community College campus, which greatly improve access to that campus and eliminate the need for the massive and costly parking structures that had planned for the campus. 3Bellevue has a long-term policy of increasing the number of bridges over I-405. For example, construction is currently under way of an extension of NE 10th St. across the freeway. 4This system was opened in 1994 to connect a high-density, high-income residential area half way up Victoria Peak on Hong Kong Island with the main streets in the commercial area below. It consists of 20 escalators and three moving sidewalks and climbs about 500 feet over its half-mile length. There are entrances and exits at all cross streets. Total travel time is 20 minutes, but most users shorten this considerably by walking while riding. The system is extremely popular and is presently used by more than 50,000 people daily. 5The approximately half mile distance from such station to the current center of downtown Bellevue is comparable to the distance from King Street Station, which is used by Sound Transit's Sounder commuter trains, to much of downtown Seattle, and it is considerably shorter than the distance between commuter rail terminals and downtown employment concentrations in a number of other U.S. cities, such as Los Angeles and San Francisco. Moreover, Bellevue commuters would have the advantages of a quicker walking time and of not having to spend time waiting for buses to take them to and from their downtown destinations, because of the moving sidewalks. In addition, the station could actually come to be in the very center of the downtown in the future as it expands eastward. 6Downtown Bellevue will continue to expand for several reasons, including its strategic location and other desirable qualities together with the large population growth that is expected for the region and the efforts that are being made to constrain sprawl (including mandates by the Puget Sound Regional Council in its "Vision 2040" regional plan). There is no room for downtown to spread to the west because of firm commitments to maintain long-established adjacent residential neighborhoods. However, a large amount of vacant or lightly used land exists to the east of I-405. Some of this land was recently rezoned for somewhat higher densities, and pressure will likely develop over time for further rezoning to allow densities comparable to those of the existing core, particularly as a result of its very close proximity to the new commuter rail station. 7Bellevue's government has shown some interest in making the city more pedestrian friendly. See, for example, Successes and Obstacles to Walkability in Bellevue, King County Overweight Prevention Initiative Forum, May 12, 2006. Created May 6, 2008. Updated July 23, 2008.